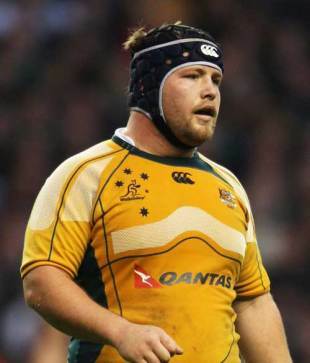 Benn Robinson can't wait to pull on a Wallabies jersey again as he nears the end of a frustrating injury lay-off. The Waratahs loose-head was forced to miss their opening Tests of the season against Fiji, England and Ireland after fracturing his arm while on Super 14 duty. With the start of their Tri-Nations campaign looming on July 24, when the Springboks visit Brisbane, Robinson has designs on proving his fitness in club rugby before putting on green and gold. "I'm champing at the bit to get back out there again," he said. "This is probably the longest break I've had in a long time and, as much as you like giving your body a break, you definitely want to be out there in those games and giving it your all. "I'm at the seven-week mark now and the doc initially said six to eight weeks and I'll be playing again. It's feeling pretty good, I had an X-ray on it last week and the scan was good. "I'll be working pretty closely with [coach] Robbie [Deans] and the team doctors to get an understanding of what he wants to do with me. I'd like to definitely play one game at least for Eastwood. I think, for me, match fitness will be a big one so getting 80 minutes at club level would really benefit my game." In the absence of Robinson and tight-head Ben Alexander, who picked up an injury against the Fijians, the Wallaby scrum was embarrassingly roughed up by England, to the tune of two penalty tries in the first Test between the sides in Perth. Ben Daley, Saia Faingaa and Salesi Ma'afu shared two caps between them prior to that encounter and Robinson, who was hurt by their plight, believes the experience will stand them, and Australian rugby, in good stead. "With the amount of work you've put in over the last three or four years it's tough to see the boys do it tough out there," he said. "That hurts me just as much as it hurts them out on the field when there's penalties against them. "Experience definitely does play a big part but those boys, as it showed against Ireland on Saturday night, they'll definitely take steps forward. Our scrum's been building for the past three or four years now and we're right up there with one of the best scrums in the world, so I think for those blokes to be thrown in the deep end is very healthy for them and healthy for rugby in Australia."